We like to give a kingly welcome to the most Royal Online Skrill Casino out there. We offer you a regal experience, giving everyone aWelcome Bonus 100% up to $/£/€100 + 20 Free Spins on Shaman's Dream on your first deposit! So let’s say for instance, you make a deposit of 20 GBP/EUR using Skrill, you will get to take advantage of theWelcome Bonus 100% up to $/£/€100 + 20 Free Spins on Shaman's Dream! No reason to let that bonus wait! Did you come here for the first time? You might benefit using our step by step tutorial. 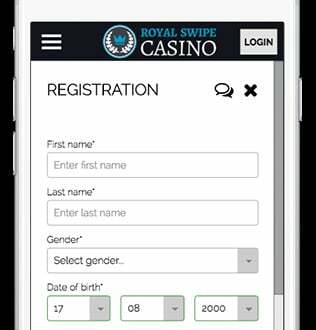 Probably by searching for one of these, because Royal Swipe is the number one Casino out there! Congratulations! You did the most important thing already; you found us! Now see the ‘Join Now’ button on the top right of your screen? That’s where you want to be! If you click that (after reading this of course!) you can fill in the registration form. You will get a text message send to your mobile phone to verify your information. Simply fill in the code we messaged you in the registration form. You are now a member of Royal Swipe! Now to claim that bonus! Go to the deposit page and click Skrill as your primary deposit method. To make your first deposit; choose an amount, fill in your email and the verification code we’ve sent you. Boom! There is your bonus! You did it! You now get to play over 400 titles in our Royal Swipe Skrill Casino. Prepare for weekly promotions and many of adventures. Can’t get enough? You don’t have to. You are able to play on any device you like at any time you wish. Join the Royal Swipe experience!